ILC Dover spacesuit used for the Apollo and Skylab programs, operational 1968. Hamilton Standard had overall development responsibility for the Apollo suit and associated portable life support system. A subcontract was awarded to International Latex Corporation for development of this suit. Status: operational 1968. Gross mass: 48 kg (105 lb). After suit development was completed, the production contract was awarded to International Latex, and the initial suit was designated A5L. The A6L design incorporated a thermal/ meteoroid garment. This was never flown. Following the Apollo fire, the suit was redesigned to eliminate flammable materials and was designated A7L (designation A8L was never used). Each Apollo astronaut had three custom fitted A7L suits - one for flight, one for training, and one for flight back-up. The Apollo suit weighed 22 kg and its PLSS Portable Life Support System, 26 kg. The A7LB modification was used for Apollo J series lunar landing missions. 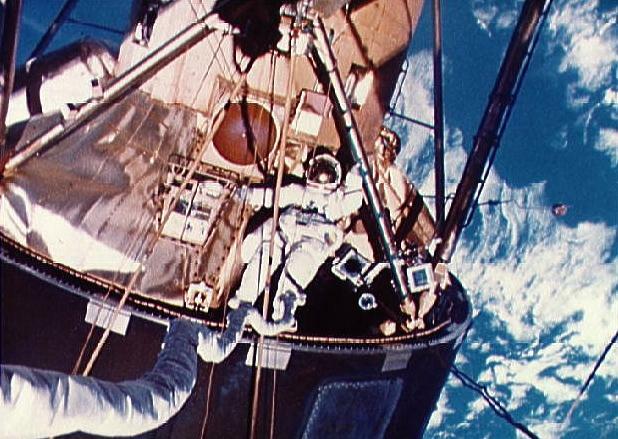 The A7LB with an additional thermal garment was used for Skylab. Apollo ASTP, with no EVA requirements, reverted to the original design. Walking on the Moon's surface a quarter million miles away from Earth presented a new set of problems to spacesuit designers. Not only did the Moon explorers' spacesuits had to offer protection from jagged rocks and the searing heat of the lunar day, but the suits also had to be flexible enough to permit stooping and bending as Apollo crewmen gathered samples from the Moon, set up scientific data stations at each landing site, and used the lunar rover vehicle, an electric-powered dune buggy, for transportation over the surface of the Moon. The additional hazard of micrometeoroids that constantly pelt the lunar surface from deep space was met with an outer protective layer on the Apollo spacesuit. A backpack portable life support system provided oxygen for breathing, suit pressurization, and ventilation for moonwalks lasting up to 7 hours, Apollo spacesuit mobility was improved over earlier suits by use of bellows-like molded rubber joints at the shoulders, elbows, hips and knees. Modifications to the suit waist for Apollo 15 through 17 missions added flexibility making it easier for crewmen to sit on the lunar rover vehicle. 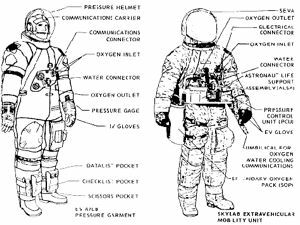 From the skin out, the Apollo A7LB spacesuit began with an astronaut-worn liquid-cooling garment, similar to a pair of long-johns with a network of spaghetti-like tubing sewn onto the fabric. Cool water, circulating through the tubing, transferred metabolic heat from the Moon explorer's body to the backpack and then to space. Next came a comfort and donning improvement layer of lightweight nylon, followed by a gas-tight pressure bladder of Neoprene-coated nylon or bellows-like molded joints components, a nylon restraint layer to prevent the bladder from ballooning, a lightweight thermal superinsulation of alternating layers of thin Kapton and glass-fiber cloth, several layers of Mylar and spacer material, and finally, protective outer layers of Teflon-coated glass-fiber Beta cloth. Apollo space helmets were formed from high-strength polycarbonate and were attached to the spacesuit by a pressure-sealing neck ring. Unlike Mercury and Gemini helmets, which were closely fitted and moved with the crewman's head, the Apollo helmet was fixed and the head was free to move within. While walking on the Moon, Apollo crewmen wore an outer visor assembly over the polycarbonate helmet to shield against eye-damaging ultraviolet radiation, and to maintain head and face thermal comfort. Completing the Moon explorer's ensemble were lunar gloves and boots, both designed for the rigors of exploring, and the gloves for adjusting sensitive instruments. 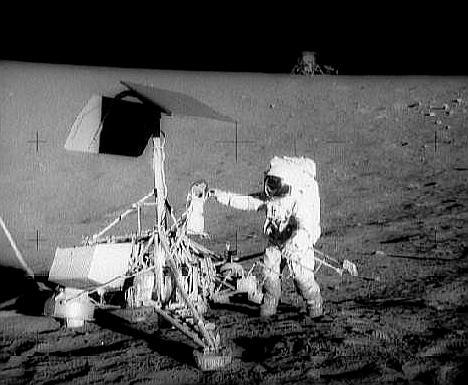 The lunar surface gloves consisted of integral structural restraint and pressure bladders, molded from casts of the crewmen's hands, and covered by multi-layered superinsulation for thermal and abrasion protection. Thumb and fingertips were molded of silicone rubber to permit a degree of sensitivity and "feel." 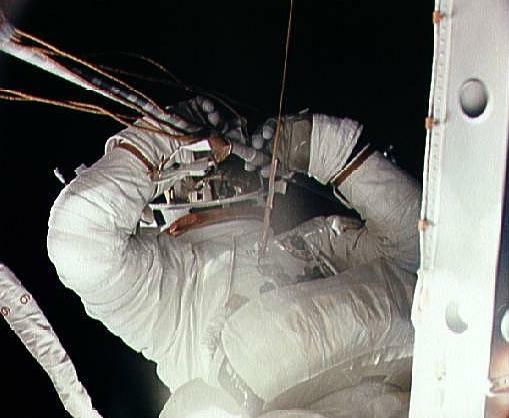 Pressure-sealing disconnects, similar to the helmet-to-suit connection, attached the gloves to the spacesuit arms. The lunar boot was actually an overshoe that the Apollo lunar explorer slipped on over the integral pressure boot of the spacesuit. The outer layer of the lunar boot was made from metal-woven fabric, except for the ribbed silicone rubber sole; the tongue area was made from Teflon-coated glass-fiber cloth. The boot inner layers were made from Teflon-coated glass-fiber cloth followed by 25 alternating layers of Kapton film and glass-fiber cloth to form an efficient, lightweight thermal insulation. Nine Skylab crewmen manned the Nation's first space station for a total of 171 days during 1973 and 1974. They wore simplified versions of the Apollo spacesuit while doing the historic repair of the Skylab and changing film canisters in the solar observatory cameras. 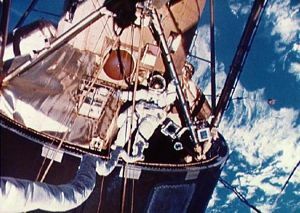 Jammed solar panels and the loss of a micrometeoroid shield during the launch of the Skylab orbital workshop necessitated several spacewalks for freeing the solar panels and for erecting a substitute shield. 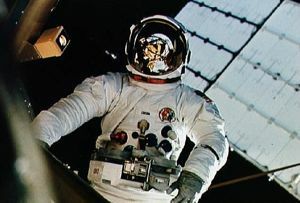 The spacesuit changes from Apollo to Skylab included a less expensive to manufacture and lightweight thermal micrometeoroid overgarment, elimination of the lunar boots, and a simplified and less expensive extravehicular visor assembly over the helmet. The liquid-cooling garment was retained from Apollo, but umbilicals and astronaut life support assembly (ALSA) replaced backpacks for life support during spacewalks. Apollo-type spacesuits were used again in July 1975 when American astronauts and Soviet cosmonauts rendezvoused and docked in Earth orbit in the joint Apollo-Soyuz Test Project (ASTP) flight. Because no spacewalks were planned, U.S. crewmen were equipped with modified A7LB intravehicular Apollo spacesuits fitted with a simple cover layer replacing the thermal micrometeoroid layer. ILC Industries, Inc., through its Dover/Frederica Division in Delaware, was the prime NASA contractor for design, development, and manufacture of space suits for the Apollo and Skylab Programs. These suits afford the necessary safety, comfort and mobility to the astronauts during Apollo and Skylab missions. Space suit development was a tribute to American Industry. Du Pont, the world's largest chemical corporation, developed materials used in 20 of the 21 layers in the ILC Industries space suit. None of these materials were developed with the moon in mind. Some were new materials, like "Kapton" film. Others, such as nylon, were discovered more than thirty years earlier by scientists who had no idea of the distance the results of their research would travel some day. Achievements in science were often put to use in unexpected places. In the case of the space suit, materials which were developed for use on earth ultimately found a place on the moon. The space suit was an airtight anthropomorphic structure called the Pressure Garment Assembly or PGA. In the space suit, the astronaut was protected from the extreme range of temperatures, the near vacuum of space and the micrometeoroid flux density that might be encountered in space or on the moon's surface. Without this protection, a man could not live, and would die within seconds after being exposed to such hostile environments. There were two basic configurations of the suit used to support Apollo Missions: an Intravehicular (IV) configuration designated as the CMP A7LB PGA, and an Extravehicular (EV) configuration identified as the EV A7LB PGA. The CMP A7LB pressure garment configuration was worn by the Command Module Pilot. The EV A&B configuration was worn by the Crew Commander and the Lunar Module Pilot. A slightly modified version of the EV A7LB PGA was used during Skylab missions. The pressure garment assembly interfaced with the spacecraft environmental control system, or the Apollo Portable Life Support System (PLSS) or the Skylab Astronaut Life Support Assembly (ALSA). The pressure garment was operational at differential pressures of 3.70 to 3.90 pounds per square inch; in temperatures of -290 to +310 degrees Fahrenheit for Apollo missions or -180 to +277 degrees Fahrenheit for Skylab missions; and in micrometeoroid flux densities normally expected within the lunar orbit perimeter about the earth or a 300,000 mile orbit. The pressure garment permitted low torque body movements for operating spacecraft controls and specially designed devices required for space exploration or traversing the lunar surface. When pressurized, the differential pressures imposed stress or tension on the suit wall. The "soft" suit became very rigid or stiff, and almost impossible to bend except in those areas where specially designed joints were provided to accommodate normal body flexure. An example of this stiffness: inflate a large cylindrical balloon or the inner tube of a tire, the balloon or tube would become very stiff and almost impossible to twist or bend. Without these specially developed joints for the space suit, it would be virtually impossible for the astronaut to do useful work on the moon's surface. These special joints were installed into the CMP A7LB suit at the knees, wrist, shoulders, elbows, ankles, and thighs. The EVA7LB suit was further modified to include special joints at the neck and waist to allow bending movements in those areas. This added suit flexibility permitted the astronaut to conserve his energy, reduce fatigue and to work for longer periods on the lunar surface. Normal body movements in the suit caused the suit joints to bend. The force required to flex these joints was applied against the inner suit wall or gas retaining layer. To preclude direct wear on the gas-retaining layer, the suit was fitted with an inner scuff layer of nylon fabric. Entrance into the suit was made through restraint and pressure-sealing zippers. The entrance opening used in the CMP A7LB assembly extended down the center of the back, from the neck area to the front crotch area. The EV AMB suit employed entrance zippers that extend from the let t side of the waist, around the back to the right side of the waist, and diagonally up to the right chest area of the suit. Routing of the zippers in the EV A7LB suit was changed from that employed in the CMP model to accommodate the new neck and waist joints. The entrance zippers could be operated by the crewman if required, but zipper actuation was normally done with the assistance of a fellow crewmember. There were two protective envelopes employed in the space suit: an inner pressurizable envelope, and an outer thermal and micrometeoroid protective envelope. The inner pressurizable envelope was called the Torso and Limb Suit Assembly (TLSA); this assembly interfaced with a detachable helmet, and a pair of removable gloves. The outer envelope used for thermal and micrometeoroid protection included an Integrated Thermal Micrometeoroid Garment (ITMG), a Lunar Extravehicular Visor Assembly (LEVA) or Skylab Extravehicular Visor Assembly (SEVA), and a pair of lunar boots that were used for Apollo Lunar missions only. The torso and limb suit consisted of an inner comfort liner, a rubber-coated nylon bladder, and an outer nylon restraint structure with the exception of the shoulder, elbow, wrist, thigh and knee joints. These joints were single wall, integrated restraint and bladder, bellows-like structures. The Thermal Micrometeoroid Garment (ITMG) was composed of an inner layer of rubber-coated nylon, alternate layers of aluminized material separated by a low-heat-conducting spacer fabric, and an outer layer of fire and abrasion resistant material. This thermal cross section employed the same insulation principle as the "Thermos" bottle when the suit was exposed to the near vacuum of space. The Lunar Extravehicular Visor Assembly (LEVA) or Skylab Extravehicular Visor Assembly (SEVA) included a shell assembly that fit over the helmet, and that clamped around its base. Two visors, two side-eyeshades, and a center eyeshade were supported by the shell. The outer sun visor employed a gold coating that reflected solar heat and light from its surface. The inner protective visor was transparent, although it included an inner coating that retained heat being emitted from the face. The protective visor was used without the sun visor during operations in shadow areas where visibility through the dark sun visor would not be adequate. The visors and eyeshades were adjustable and could be moved to positions selected by the crewman for his comfort and safety. The Lunar Boots were slip-on assemblies that include a cross section of materials similar to those in the ITMG. There were additional layers of materials used in the boot sole as necessary to reduce the transfer of heat from the lunar surface to the foot. Metal-woven fabric or "Chromel-R" formed the outer shell of the boots to resist high lunar surface temperatures and surface abrasion. The outer structure of the boots in the sole consisted of silicone rubber that was sewn to the outer metal fabric shell and afforded improved wear and thermal protection to the boots. For each PGA, there were two pairs of gloves used to support Apollo and Skylab missions: Intravehicular (IV) Gloves and Extravehicular (EV) Gloves. The IV Glove was a single-wall restraint and bladder structure formed to fit the crewman's hand. For scuff protection and added structural support, an outer gauntlet and palm restraint system was fitted over the glove. The palm restraint afforded improved hand dexterity for operating spacecraft controls and special devices. The EV Glove included an IV Glove that was fitted with an outer thermal glove that employed a similar cross section to that of the ITMG. For abrasion and thermal protection, the outer shell was constructed of metal-woven fabric, and the fingertips were fitted with silicone rubber caps. The outer thermal glove extended well back over the IV glove-TLSA juncture. Gaseous oxygen was circulated through the suit by the PLSS (backpack) or ALSA, or the spacecraft environmental control system for respiration, pressurization, and ventilation purposes. The oxygen was directed to the helmet from inlet gas connectors on the suit, down over the body, to the arm and leg extremities, and then was directed through ducts to the exhaust gas connectors. The impurities were removed from the gas stream as it passed through the spacecraft environmental control system or portable life support system, and then was recirculated through the suit. The ventilation system removed body heat from within the suit during intravehicular operations, or when free space EV activities were performed remote from the spacecraft. During lunar surface excursions the metabolic heat generated by the body exceeded the capability of the ventilation system, so a liquid cooling system was employed which removed the major portion of body heat from within the PGA; thereby reducing fatigue as a result of body dehydration through perspiration. The Liquid Cooling Garment (LCG) consisted of a network of polyvinyl tubing that was supported by spandex fabric. The garment was worn next to the skin and covered the entire body exclusive of the head and hands. A liquid coolant or water was circulated through the tubing from the portable life support system. In the suit, heat was transferred from the body to the liquid through the tubing wall, and in the portable life support system, the heat was removed from the liquid before it was recirculated back to the LCG. Providing the spacesuit for the Apollo & Skylab Programs was just one part that ILC played in the role of protecting man from hazardous environments. ILC Industries, Inc. was proud of its role in the space program and vigorously supported the ever-expanding field of aerospace technology. We had over twenty years of experience in research, development, and manufacture of air-inflated assemblies, pressure vessels and life support systems. This experience provided a sound base for our continuing research, development and design of aerospace life support equipment, and had given ILC its place as the leader in this field. Family: Space Suits. Country: USA. Agency: NASA, ILC Dover. Bibliography: 16, 2508, 2509, 2510, 2511, 2512, 2513, 2514, 2515, 2516, 66. Apollo thermal coverall for space suit - . Nation: USA. Program: Apollo. Spacecraft: A7L. A thermal coverall for use in extravehicular space suit design was completed in-house and would be shipped to Vought Astronautics for use in the MSC evaluation contract..
Hamilton Standard to develop the Apollo space suit - . Nation: USA. Program: Apollo. Spacecraft: A7L. Hamilton Standard Division of United Aircraft Corporation selected by NASA to develop the Apollo space suit..
Hamilton Standard contract for the Apollo space suit assembly - . Nation: USA. Program: Apollo. Spacecraft: A7L. The Hamilton Standard Division of United Aircraft Corporation was selected by NASA as the prime contractor for the Apollo space suit assembly. Hamilton's principal subcontractor was International Latex Corporation, which would fabricate the pressure garment. The contract was signed on October 5. 1962 October 5 - . 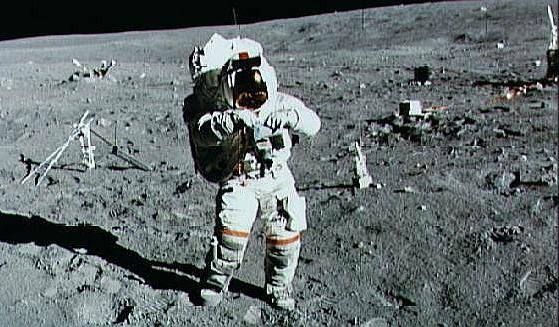 Contract to Hamilton Standard for development of a space suit for Apollo - . Nation: USA. Program: Apollo. Spacecraft: A7L. NASA signed a $l.55-million contract with Hamilton Standard Division of United Aircraft Corporation and International Latex Corporation for the development of a space suit for the Apollo crewmen. As the prime contractor, Hamilton Standard would have management responsibility for the overall program and would develop a life-support, backpack system to be worn by crewmen during lunar expeditions. International Latex Corporation as subcontractor would fabricate the suit, with Republic Aviation Corporation furnishing human factors information and environmental testing. The suit would allow a crewman greater mobility than previous space suits, enabling him to walk, climb, and bend with relative ease. 1962 November 27 - . Negotiations between NASA and North American on the Apollo spacecraft development contract - . Nation: USA. Program: Apollo. Spacecraft: A7L. MSC Director Robert R. Gilruth reported to the Manned Space Flight (MSF) Management Council that formal negotiations between NASA and North American on the Apollo spacecraft development contract would begin in January 1963. He further informed the council that the design release for all Apollo systems, with the exception of the space suit, was scheduled for mid-1963; the suit was scheduled for January 1964. Mating the Apollo portable life support system to the ILC space suit configuration discussed - . Nation: USA. Program: Apollo. Spacecraft: A7L. Representatives of Hamilton Standard and International Latex Corporation (ILC) met to discuss mating the portable life support system to the ILC space suit configuration. As a result of mockup demonstrations and other studies, over-the-shoulder straps similar to those in the mockup were substituted for the rigid "horns." Sketch of the space suit assembly to be worn on the lunar surface - . Nation: USA. Program: Apollo. Spacecraft: A7L, LM Communications, LM ECS. MSC released a sketch of the space suit assembly to be worn on the lunar surface. It included a portable life support system which would supply oxygen and pressurization and would control temperature, humidity, and air contaminants. The suit would protect the astronaut against solar radiation and extreme temperatures. The helmet faceplate would shield him against solar glare and would be defrosted for good visibility at very low temperatures. An emergency oxygen supply was also part of the assembly. Full two-way voice communication between two astronauts on the lunar surface, using the transceivers in the LEM and CM as relay stations. Redundant one-way voice communication capability between any number of suited astronauts. Telemetry of physiological and suit environmental data to the LEM or CM for relay to earth via the S- band link. (The EVSCT contract was awarded to International Telephone and Telegraph (ITT) Corporation's Kellogg Division). Hamilton Standard space suit contract amended to include communications and telemetry - . Nation: USA. Program: Apollo. Spacecraft: A7L. The Hamilton Standard space suit contract was amended to include supplying space suit communications and telemetry equipment..
1963 March 26 - . ITT to manufacture a prototype Apollo extravehicular suit telemetry and communications system - . Nation: USA. Program: Apollo. Spacecraft: A7L. Hamilton Standard Division awarded a contract to ITT/Kellogg for the design and manufacture of a prototype extravehicular suit telemetry and communications system to be used with the portable life support system..
1963 March 26-28 - . Meeting to define Apollo CM-space suit interface problem areas - . Nation: USA. Program: Apollo. Spacecraft: A7L, Apollo CSM, CSM ECS. A meeting was held at North American to define CM-space suit interface problem areas. Demonstrations of pressurized International Latex suits revealed poor crew mobility and task performance inside the CM, caused in part by the crew's unavoidably interfering with one another. Other items received considerable attention: A six-foot umbilical hose would be adequate for the astronaut in the CM. The location of spacecraft water, oxygen, and electrical fittings was judged satisfactory, as were the new couch assist handholds. The astronaut's ability to operate the environmental control system (ECS) oxygen flow control valve while couched and pressurized was questionable. Therefore, it was decided that the ECS valve would remain open and that the astronaut would use the suit control valve to regulate the flow. It was also found that the hand controller must be moved about nine inches forward. 1963 - During the second quarter - . Stowage of crew equipment in both the Apollo CM and LEM worked out - . Nation: USA. Program: Apollo. Spacecraft: A7L, Apollo LM, CSM Cockpit, LM Structural. MSC reported that stowage of crew equipment, some of which would be used in both the CM and the LEM, had been worked out. Two portable life support systems and three pressure suits and thermal garments were to be stowed in the CM. Smaller equipment and consumables would be distributed between modules according to mission phase requirements. Experiments simulating the impact of micrometeoroids on the lunar surface - . Nation: USA. Program: Apollo. Spacecraft: A7L. NASA issued a technical note reporting that scientists at Ames Research Center Hypervelocity Ballistic Range, Moffett Field, Calif., were conducting experiments simulating the impact of micrometeoroids on the lunar surface. The experimenters examined the threat of surface debris, called secondary ejecta, that would be thrown from resultant craters. Data indicated that secondary particles capable of penetrating an astronaut's space suit nearly equaled the number of primary micrometeoroids. Thus the danger of micrometeoroid impact to astronauts on the moon may be almost double what was previously thought. 1963 May 22 - . Grumman representatives met with the Apollo ASPO Electrical Systems Panel (ESP) - . Nation: USA. Program: Apollo. Spacecraft: A7L, Apollo LM, CSM Communications, LM Communications. Grumman representatives met with the ASPO Electrical Systems Panel (ESP). From ESP, the contractor learned that the communications link would handle voice only. Transmission of physiological and space suit data from the LEM to the CM was no longer required. VHF reception of this data and S-band transmission to ground stations was still necessary. In addition, Grumman was asked to study the feasibility of a backup voice transmitter for communications with crewmen on the lunar surface should the main VHF transmitter fail. Grumman studied use of the PLSS lithium hydroxide cartridges in the Apollo LEM ECS - . Nation: USA. Program: Apollo. Spacecraft: A7L, Apollo LM, LM ECS. Grumman studied the possibility of using the portable life support system lithium hydroxide cartridges in the LEM environmental control system, and determined that such common usage was feasible. This analysis would be verified by tests at Hamilton Standard. 1963 June 26 - . Frictionless platform to simulate extravehicular activity - . Nation: USA. Program: Apollo. Spacecraft: A7L. MSC announced that it had contracted with the Martin Company to develop a frictionless platform to simulate the reactions of an extravehicular astronaut in five degrees of freedom-pitch, yaw, roll, forward-backward, and side-to-side. MSC Crew Systems Division would use the simulator to test and evaluate space suits, stabilization devices, tethering lines, and tools. Two portable life support systems to be stowed in the Apollo LEM and one in the CM - . Nation: USA. Program: Apollo. Spacecraft: A7L, Apollo LM, CSM ECS, LM Electrical. MSC reported that two portable life support systems would be stowed in the LEM and one in the CM. Resupplying water, oxygen, and lithium hydroxide could be done in a matter of minutes; however, battery recharging took considerably longer, and detailed design of a charger was continuing. 1963 July 18 - . Apollo portable life support system (PLSS) to have three attaching points for stowage - . Nation: USA. Program: Apollo. Spacecraft: A7L, Apollo LM. North American, Grumman, and Hamilton Standard, meeting at MSC with Crew Systems Division engineers, agreed that the portable life support system (PLSS) would have three attaching points for stowage in the spacecraft. In addition, it was agreed that the PLSS should not be used for shoulder restraint in the LEM. 1963 July 28-August 3 - . Grumman to design identical connectors for both ends of the space suit hoses in the Apollo LEM - . Nation: USA. Program: Apollo. Spacecraft: A7L, Apollo LM. ASPO ordered Grumman to design identical connectors for both ends of the space suit hoses in the LEM. This arrangement, called the "buddy concept," would permit one portable life support system to support two crewmen and thus would eliminate the need for a special suit-to-suit hose. 1963 August 15-September 21 - . Mobility tests of the Apollo prototype space suit - . Nation: USA. Program: Apollo. Spacecraft: A7L, Apollo CSM, CSM Cockpit. MSC Crew Systems Division conducted mobility tests of the Apollo prototype space suit inside a mockup of the CM. Technicians also tested the suit on a treadmill. The subjects' carbon dioxide buildup did not exceed two percent; their metabolic rates were about 897,000 joules (850 BTU) per hour at vent pressure, 1,688,000 joules at 2.4 newtons per square centimeter (1,600 BTU at 3.5 psi), and 2,320,000 joules at 3.5 newtons per square centimeter (2,200 BTU at 5.0 psi). First operational prototype Apollo space suit communications system - . Nation: USA. Program: Apollo. Spacecraft: A7L. ITT's Kellogg Division delivered to Hamilton Standard the first operational prototype space suit communications system..
1963 Week of August 18 - . MSC completed a comparison of 17-volt and 28-volt batteries for the portable life support system - . Nation: USA. Program: Apollo. Spacecraft: A7L. MSC completed a comparison of 17-volt and 28-volt batteries for the portable life support system. The study showed that a 28-volt battery would provide comparable energy levels without increase in size and weight and would be compatible with the spacecraft electrical system. 1963 September 9 - . Apollo CM to be able to charge the 28-volt portable life support system battery - . Nation: USA. Program: Apollo. Spacecraft: A7L, Apollo CSM, CSM Cockpit. MSC ordered North American to make provisions in the CM to permit charging the 28-volt portable life support system battery from the spacecraft battery charger. On the following day, the Center informed North American also that a new mechanical clock timer system would be provided in the CM for indicating elapsed time from liftoff and predicting time to and duration of various events during the mission. 1963 September 19-25 - . Apollo space suit umbilical disconnects redesigned for interchangeability - . Nation: USA. Program: Apollo. Spacecraft: A7L, Apollo LM, CSM Cockpit. The space suit umbilical disconnects were being redesigned to the "buddy concept" and for interchangeability between the CM and the LEM. MSC was reviewing methods for a crewman to return to the LEM following space suit failure on the lunar surface. 1963 September 26-27 - . Evaluation of the Apollo space suit integration into the LEM - . Nation: USA. Program: Apollo. Spacecraft: A7L, Apollo LM, LM Weight. MSC representatives visited Grumman for a preliminary evaluation of the Apollo space suit integration into the LEM. A suit failure ended the exercise prematurely. Nonetheless, leg and foot mobility was good, but the upper torso and shoulder needed improvement. On October 11, MSC Crew Systems Division (CSD) tested the suit's mobility with the portable life support system (PLSS). CSD researchers found that the PLSS did not restrict the wearer's movement because the suit supported the weight of the PLSS. Shifts in the center of gravity appeared insignificant. The PLSS controls, because of their location, were difficult to operate, which demanded further investigation. 1963 September 26-October 2 - . Portable life support system in the Apollo CM be deleted - . Nation: USA. Program: Apollo. Spacecraft: A7L, Apollo LM, CSM Cockpit. North American recommended that the portable life support system in the CM be deleted. Current planning placed two units in the LEM and one in the CM..
1963 October 20-November 16 - . Testing begun on prototype Apollo extravehicular suit systems - . Nation: USA. Program: Apollo. Spacecraft: A7L. MSC reported that preliminary testing had begun on the first prototype extravehicular suit telemetry and communications system and on the portable life support system of which it was an integral part. The hardware had recently been received from the prime contractor, Hamilton Standard. 1963 November 8 - . Flammability tests on Apollo constant wear garment material - . Nation: USA. Program: Apollo. Spacecraft: A7L. MSC Crew Systems Division, conducting flammability tests on the constant wear garment material in a 3.5 newtons per square centimeter (5 psi), 100 percent oxygen atmosphere, reported that no fires had been experienced thus far..
1963 November 17-December 21 - . Hamilton Standard to develop a micrometeoroid protective garment to be worn over the A7L Space Suit - . Nation: USA. Program: Apollo. Spacecraft: A7L. As a result of an MSC Crew Systems Division-Hamilton Standard meeting on the space suit, MSC directed the company to develop a micrometeoroid protective garment to be worn over the suit..
1963 December 16-January 15 - . Apollo CM environmental control system redesign - . Nation: USA. Program: Apollo. Spacecraft: A7L, Apollo CSM, CSM ECS. MSC directed North American to redesign the CM environmental control system compressor to provide 0.283 cubic meters (10 cubic feet) of air per minute to each space suit at 1.8 newtons per square centimeter (3.5 psi), 16.78 kilograms (37 pounds) per hour total. 1963 December 29-January 4 - . Hamilton Standard to modify the Apollo space suit helmet - . Nation: USA. Program: Apollo. Spacecraft: A7L. Based upon centrifuge test results, MSC directed Hamilton Standard to modify the space suit helmet. The vomitus port and other obstructions to the line of sight in the downward direction were deleted..
1964 January 7 - . Grumman to implement changes to space suit oxygen umbilical hoses - . Nation: USA. Program: Apollo. Spacecraft: A7L, Apollo LM. 1964 January 10 - . Apollo LEM extravehicular suit telemetry and communications system review - . Nation: USA. Program: Apollo. Spacecraft: A7L, Apollo LM. The Flight Data Systems Branch of the Engineering and Development Directorate provided ASPO's Lunar Mission Planning Branch with information about the LEM extravehicular suit telemetry and communications system. No line of sight (LOS) communications were possible, and there would be no ground wave propagation and no atmospheric reflection. 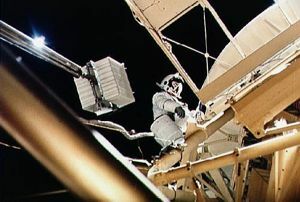 The link between astronaut and LEM would be limited to LOS of the two antennas, and surface activities by an extravehicular astronaut must be planned accordingly. 1964 February 19-20 - . Acceptance testing of prototype Apollo space suit - . Nation: USA. Program: Apollo. Spacecraft: A7L. MSC officials conducted acceptance testing of the 024 prototype space suit at the International Latex Corporation. (Reviewers identified several faults, but they were minor and the suit was accepted.). 1964 February 22 - . Studies of the dangers of meteoroids and radiation in the Apollo program - . Nation: USA. Related Persons: Mueller. Program: Apollo. Spacecraft: A7L, Apollo CSM, CSM Cockpit. George E. Mueller, NASA Associate Administrator for Manned Space Flight, summarized recent studies of the dangers of meteoroids and radiation in the Apollo program. Data from the Explorer XVI satellite and ground observations indicated that meteoroids would not be a major hazard. Clouds of protons ejected by solar flares would present a risk to astronauts, but studies of the largest solar flares recorded since 1959 showed that maximum radiation dosages in the CM and the Apollo space suit would have been far below acceptable limits (set in July 1962 by the Space Science Board of the National Academy of Sciences). Cosmic rays would not be a hazard because of their rarity. Radiation in the Van Allen belts was not dangerous because the spacecraft would fly through the belts at high speeds. 1964 February 27 - . Improved version of the Apollo space suit - . Nation: USA. Program: Apollo. Spacecraft: A7L. MSC Crew Systems Division (CSD) received an improved version of the Apollo space suit (the A-3H-024 Phase B). In the course of the following week, CSD engineers examined the suit for weight, leakage, donning, and mobility..
1964 February 27-March 4 - . Apollo space suit development review - . Nation: USA. Program: Apollo. Spacecraft: A1C, A7L. 1964 March 24 - . Narrower hatch configuration for Apollo Block II - . Nation: USA. Program: Apollo. Spacecraft: A7L, Apollo CSM, CSM Block II. To verify a narrower hatch configuration proposed for Block II spacecraft, North American evaluated the capability of an astronaut wearing a pressurized space suit and a portable life support system to pass through the main hatch of the CM for extravehicular activities. Subjects were able to enter and leave the mockup without undue difficulty despite the presence of gravity. 1964 April 1 - . Contract for 27 prototype Apollo space suits - . Nation: USA. Program: Apollo. Spacecraft: A7L. MSC negotiated a cost-plus-incentive-fee contract, valued at $1.65 million, with Hamilton Standard for 27 prototype Apollo space suits and 12 pairs of gloves..
1964 April 15-16 - . Demonstration of space suits using the LEM TM-1 mockup - . Nation: USA. Program: Apollo. Spacecraft: A7L, Apollo LM, LM Hatch. MSC Crew Systems Division representatives attended a demonstration at Grumman of Apollo Phase B and Gemini space suits using the LEM TM-1 mockup and a mockup portable life support system. Tests demonstrated ingress egress capability through the forward and top hatches, operation of controls and displays, and methods of getting out on the lunar surface and returning to the spacecraft. 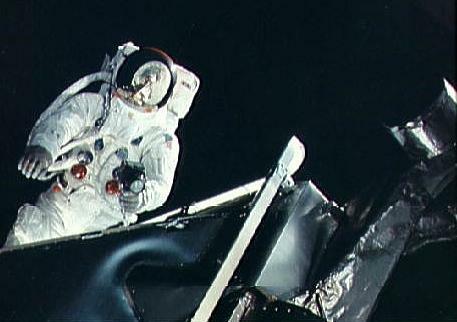 Generally, the A7L Space Suit proved sufficiently mobile for all these tasks, though there was no great difference between its performance and that of the Gemini suit during these trials. 1964 April 21 - . Urine storage in the Apollo space suit for prelaunch and launch - . Nation: USA. Program: Apollo. Spacecraft: A7L. ASPO directed Hamilton Standard to provide urine storage in the Apollo space suit for prelaunch and launch. The contractor was to investigate the suitability of a Mercury-Gemini type urinal for storage and subsequent disposal.. Basic rules for Apollo space suit operation established - . Nation: USA. Program: Apollo. Spacecraft: A7L. At least one crewman would wear his space suit at all times. All three crewmen would wears their suits continuously during launch through translunar injection, lunar operations, and reentry. The three crewmen could remain suited at all times, although they could remove the suits during translunar and transearth phases. The crew would be able to return from any point in the mission in pressurized suits. Two men in the CM would be able to don their suits within five minutes. Operations Planning Division reported that these rules required no modifications to the suit and only minor changes to the environmental control system. 1964 April 23-30 - . Grumman redesigned Apollo LEM environmental control system to use PLSS cartridges for emergencies - . Nation: USA. Program: Apollo. Spacecraft: A7L, Apollo LM, LM ECS. Grumman redesigned the LEM environmental control system to incorporate a replaceable lithium hydroxide cartridge with a portable life support system cartridge in parallel for emergency backup. The LEM cartridge would be replaced once during a two-day mission. 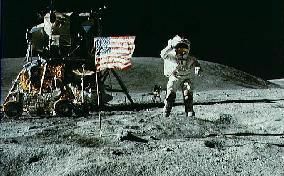 Also MSC advised Grumman that estimates of the metabolic rates for astronauts on the lunar surface had been increased. The major effect of this change was an increase in the requirements for oxygen and water for the portable life support system. 1964 October 15-22 - . Decisions on Apollo crew transfer and space suit procedures - . Nation: USA. Program: Apollo. Spacecraft: A7L, Apollo LM, LM ECS. Crew transfer, both pressurized and unpressurized, would be accomplished using the environmental control system umbilicals. The CM and LEM umbilicals would be designed accordingly. Crew Systems would request the necessary engineering changes. The requirement for "quick-don" capability for the space suit would be reevaluated by Systems Engineering people. If the probability of a rapid decompression of the spacecraft during "noncritical" mission phases was negligible, "quick-don" capability might be eliminated. This would ease several design constraints on the suit. The question of a crossover valve in the CM, for ventilation during open-faceplate operation, was postponed pending the decompression study and ventilation tests at Hamilton Standard. 1964 October 27 - . Apollo drops the buddy system concept - . Nation: USA. Program: Apollo. Spacecraft: A7L, Apollo LM, CSM ECS, LM ECS. Because of the redesign of the portable life support system that would be required, MSC directed Grumman and North American to drop the "buddy system" concept for the spacecraft environmental control system (ECS) umbilicals. The two LEM crewmen would transfer from the CM while attached to that module's umbilicals. Hookup with the LEM umbilicals, and ventilation from the LEM ECS, would be achieved before disconnecting the first set of lifelines. MSC requested North American to cooperate with Grumman and Hamilton Standard on the design of the fetal end of the umbilicals. Also, the two spacecraft contractors were directed jointly to determine umbilical lengths and LEM ECS control locations required for such transfer. 1964 October 29-November 5 - . Apollo hard shell meteoroid garment - . Nation: USA. Program: Apollo. Spacecraft: A7L, Apollo LM. The MSC Meteoroid Technology Branch inspected a hard shell meteoroid garment built by the Center's Crew Systems Division. It was only a crude prototype, yet it in no way hampered mobility of the pressurized suit. The Meteoroid Technology people were satisfied that, should a hard garment be necessary for protection of the Apollo extravehicular mobility unit, this concept was adequate. The garment might present stowage problems, however, and investigations were underway to determine the minimum area in the LEM that would be required. Portable light assembly for the Apollo CM canceled - . Nation: USA. Program: Apollo. Spacecraft: A7L, Apollo CSM, CSM Cockpit. MSC directed North American to halt development of a portable light assembly for the CM. It was not required, the Center said, because the spaceship's primary lighting system included extendable floodlights. Small lights on the fingertips of the space suit and a flashlight in the survival kit were also available if needed. 1964 November 5 - . Apollo Space Suit designated Extravehicular Mobility Unit - . Nation: USA. Program: Apollo. Spacecraft: A7L. The Apollo Space Suit Assembly received a new designation, the Apollo Extravehicular Mobility Unit. The purpose of the change was to make it more descriptive of its function in the Apollo mission..
1964 November 12-19 - . Alternatives to the current design of the space suit helmet - . Nation: USA. Program: Apollo. Spacecraft: A7L. MSC reviewed a number of alternatives to the current design of the space suit helmet. Engineers selected a modified concept, one with the smallest feasible dimensions and began fabricating a thin fiber glass shell. The product would serve as the test article in a series of tests of an immobile, bubble-type helmet. The whole of this effort would support MSC's in-house program to find the best possible helmet design. 1964 November 13 - . Reliability figures for the Apollo space suit assembly reviewed - . Nation: USA. Program: Apollo. Spacecraft: A7L. 1964 November 18 - . Unmanned testing of Gemini and Apollo space suits - . Nation: USA. Program: Apollo. Spacecraft: A1C, A7L, Gemini. Ling-Temco-Vought received a contract from MSC, valued at $365,000, for unmanned testing of Gemini and Apollo space suits in the firm's space environment simulator..
1964 November 19-26 - . Lights on the fingertips of space suits adequate - . Nation: USA. Program: Apollo. Spacecraft: A7L, Apollo CSM, CSM Cockpit. Apollo extravehicular mobility unit micrometeoroid protection garment - . Nation: USA. Program: Apollo. Spacecraft: A7L. The MSC Crew Systems Division reviewed the extravehicular mobility unit micrometeoroid protection garment. It was estimated a total weight of 13 to 18 kg (30 to 40 lbs) would be required for the two micrometeoroid protection garments which had a crew safety reliability goal of 0.9999 for the meteoroid hazard. Ground rules for their design were being defined. Problems in donning and doffing the Apollo space suit elements - . Nation: USA. Program: Apollo. Spacecraft: A7L. MSC conducted studies to determine problems in donning and doffing the Apollo external thermal garment (ETG) and portable life support system (PLSS) by a subject in a full-pressure suit. The subject donned and doffed the ETG and PLSS unassisted with the suit in a vented condition and with assistance while the suit was pressurized to 25.5 kilonewtons per sq m (3.7 psig). Tests showed the necessity of redesigning the ETG in the neck and chest area to prevent a gathering of excess material which restricted downward visibility. Apollo space suit manufacturers to provide personal communications equipment - . Nation: USA. Program: Apollo. Spacecraft: A7L. Crew Systems Division gave space suit manufacturers the responsibility of providing personal communications equipment in their products..
1964 December 9 - . Effects of radiation and vacuum on the materials of space suits - . Nation: USA. Program: Apollo. Spacecraft: A7L. Avco Corporation was under a 10-month contract amounting to $124,578 to MSC to study the effects of solar radiation and ultra-high vacuum on the materials and components of space suits. Testing would be performed in the Avco space environment chamber..
1964 December 14 - . Apollo LM to provide six recharges and three batteries to the portable life support system - . Nation: USA. Program: Apollo. Spacecraft: A7L. ASPO's Operations Planning Division directed Grumman to provide six recharges of the portable life support system (PLSS) and three PLSS batteries (rechargeable and replaceable).. Modifications to the thermal garment for Apollo space suit - . Nation: USA. Program: Apollo. Spacecraft: A7L. Crew Systems Division (CSD) engineers, in their continuing effort to improve the design of the space suit, recommended a number of modifications to the thermal garment for example, a larger sleeve opening to facilitate inserting the second arm; and alterations to the neck and chest to increase the astronaut's downward view. By the middle of January, CSD's Robert E. Smylie could report several major design changes improved greatly the suit's don doff characteristics and made it less bulky. 1964 December 23 - . Molds for the one-piece bubble helmets for the Apollo space suits constructed - . Nation: USA. Program: Apollo. Spacecraft: A7L. NASA Technical Services constructed the molds that would be used to make the one-piece bubble helmets for the Apollo space suits. These forms would be delivered to General Electric and to Texstar, the two firms that would actually fabricate the helmets, with the first shell expected about mid-January. At the same time, Crew Systems Division completed drop tests on the new helmet concept. The division's engineers also began designing and fabrication of support items (neck rings, feed ports, and skull caps), as well as exploring methods of maintaining the helmet's hygiene and habitability. 1964 - During the last quarter - . Apollo portable life support system (PLSS) power growth impacts LEM - . Nation: USA. Related Persons: Shea. Program: Apollo. Spacecraft: A7L, Apollo LM, LM Electrical. During November, however, Hamilton Standard and Crew Systems Division (CSD) engineers advised the Instrumentation and Electronic Systems Division (IESD) that the PLSS's power requirements had increased to about 200 watt-hours. (CSD had jurisdiction over the PLSS, including battery requirements; IESD was responsible for the charger.) Hamilton Standard placed most of the blame on the cooling pump motor, which proved far less efficient than anticipated, as well as on the addition of biosensor equipment. ASPO Manager Joseph F. Shea, reviewing the company's explanation, commented that "this says what happened . . . but is far from a justification - this is the type of thing we should understand well enough to anticipate." "How can this happen," he wondered, ". . . in an area which has been subjected to so much discussion and delay?" Representatives from Grumman and Hamilton Standard, meeting at MSC on December 17, redefined PLSS battery and charging requirements, and Grumman was directed to proceed with the development of the battery charger. This episode was accompanied by some sense of urgency, since Grumman had to have firm requirements before the end of year to prevent a schedule slippage. Use of modified Gemini space suits for Block I Apollo - . Nation: USA. Program: Apollo. Spacecraft: A1C, A7L, Gemini. Crew Systems Division approved the use of modified Gemini space suits in Block I Apollo spacecraft. MSC and David Clark Company amended their Gemini suit contract to cover design and fabrication of a prototype Block I suit..
1965 January 6 - . Partial donning of the Apollo space suit - . Nation: USA. Program: Apollo. Spacecraft: A7L, Apollo CSM, CSM Block II. ASPO's Systems Engineering Division (SED) investigated the possibility of partial donning of the space suit (sans helmet and gloves) and the consequent effects upon operation of the CM environmental control system (ECS). (Current ECS design called for shirtsleeve and full-suited operations.) The systems engineers found that, with vehicle reliability based upon shirtsleeve environments, wearing part of the suit contributed little toward protecting the astronaut against loss of cabin pressure. Most pressure-seal failures in the spacecraft would still allow the astronaut time to don the complete suit. Catastrophic failures (i.e., loss of windows or hatches) were highly improbable, but if one of this type occurred, depressurization would be so rapid as to preclude the astronaut's donning even a part of the suit. Actually, overall mission reliability was greatest with the shirtsleeve environment; continuous suit wear degraded the garment's reliability for the lunar exploration phase of the flight. Moreover, a number of design changes in the spacecraft would be required by partial suit wear. SED concluded that, to build confidence in the spacecraft's pressurization system, Block I CM's should be outfitted for partial suit wear. In Block II vehicles the suit should not be worn during translunar mission phases (again because of mission reliability). SED recommended to the ASPO Manager, therefore, that he direct North American to incorporate provisions for partial suit wear in Block I and to retain the shirtsleeve concept for the Block II spacecraft. 1965 January 25 - . Backup Apollo Block II space suit development program - . Nation: USA. Program: Apollo. Spacecraft: A7L, Apollo CSM, CSM Block II. MSC negotiated a backup Block II space suit development program with David Clark Company, which paralleled the Hamilton Standard program, at a cost of $176,000. Criteria for selecting the suit for ultimate development for Block II would be taken from the Extravehicular Mobility Unit Design and Performance Specification. A selection test program would be conducted at MSC using the CM mockup, the lunar simulation facility, and the LEM mockup. 1965 January 27 - . Proposal to stage the Apollo space suit - . Nation: USA. Program: Apollo. Spacecraft: A7L. MSC evaluated Grumman's proposal to stage components of the extravehicular mobility unit to achieve a substantial weight reduction..
Development tests on Apollo space suit heat exchanger - . Nation: USA. Program: Apollo. Spacecraft: A7L. 1965 February 11-18 - . Apollo bubble helmet design - . Nation: USA. Program: Apollo. Spacecraft: A7L. Two-week wearing test of the Apollo liquid-cooled undergarment - . Nation: USA. Program: Apollo. Spacecraft: A7L. 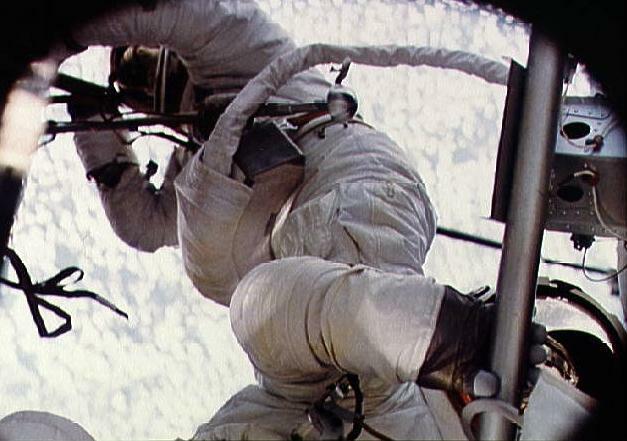 Hamilton Standard, the extravehicular mobility unit contractor, completed a two-week wearing test of the Apollo liquid-cooled undergarment. Investigators found that the garment could be worn for the entire lunar mission without any serious discomfort..
Navy testing of the Gemini Block I Apollo space suit - . Nation: USA. Program: Apollo. Spacecraft: A1C, A7L, Gemini. David Clark contracted for Apollo Block I space suits - . Nation: USA. Program: Apollo. Spacecraft: A7L. MSC and the David Clark Company reached an agreement on a contract for Apollo Block I space suits. The first suits, expected by July 1, would go to North American for testing..
Recharger for the portable life support system (PLSS) batteries not required - . Nation: USA. Program: Apollo. Spacecraft: A7L, Apollo LM, LM Electrical. MSC notified Grumman that a device to recharge the portable life support system's (PLSS) batteries was no longer required in the LEM. Instead, three additional batteries would be stored in the spacecraft (bringing the total number of PLSS batteries to six). Shirtsleeve environment to be retained in Apollo CM - . Nation: USA. Program: Apollo. Spacecraft: A7L, Apollo CSM, CSM ECS. After extensive analysis, Crew Systems Division recommended that the "shirtsleeve" environment be kept in the CM. Such a design was simpler and more reliable, and promised much greater personal comfort than wearing the space suit during the entire mission. Subcontractor change for the garment portion of the Apollo space suit - . Nation: USA. Program: Apollo. Spacecraft: A7L. Because of continuing developmental problems, Hamilton Standard chose B. F. Goodrich to replace International Latex as subcontractor for the garment portion of the Apollo space suit..
1965 March 18-25 - . Evaluation of Apollo liquid-cooled garment LCG-8 - . Nation: USA. Program: Apollo. Spacecraft: A7L. Crew Systems Division (CSD) engineers, continuing their evaluation of liquid-cooled garments (LCG), tested Hamilton Standard's newest version (the LCG-8). The manufacturer had modified placement of the tubes and had used a stretchable, more closely knit fabric. CSD found this style an improvement over its predecessor (the LCG-3): it was more efficient, more comfortable, and easier to don and doff. CSD officials accordingly froze the configuration of the garment around this latest model. Further design work would be minimal (chiefly interface modifications and improvements in fabrication techniques). 1965 April 1-8 - . Apollo cryoformed steel bottle for the portable life support system passed its first tests - . Nation: USA. Program: Apollo. Spacecraft: A7L. The cryoformed steel bottle for the portable life support system, manufactured by Arde-Portland, Inc., passed its first burst and cycling tests, which Crew Systems Division called a "major milestone" in its development..
1965 April 8-15 - . Evaluation of external thermal garments and Apollo portable life support systems (PLSS) - . Nation: USA. Program: Apollo. Spacecraft: A7L. The MSC Crew Performance Section evaluated the ability of two pressure-suited astronauts to put on and take off their external thermal garments and portable life support systems (PLSS). The subjects had considerable difficulty positioning the PLSS; also, though these modified thermal garments were much easier to don and doff, the subjects still experienced some trouble inserting the second arm. Apollo Block I and Block II suit interface control documents - . Nation: USA. Program: Apollo. Spacecraft: A7L, Apollo CSM. ASPO informed North American that a meeting would be held at its Downey, California, plant April 20-23 to negotiate and have signed off all Block I and Block II suit interface control documents (ICDs) and the government furnished equipment ICDs. Hamilton Standard, Grumman, and David Clark were being instructed to have representation present to achieve the signed ICDs. North American was instructed to have the ICDs in final form to be signed or negotiated. 1965 April 19-26 - . Meeting resolved all interfaces between the Apollo space suit and the two blocks of spacecraft - . Nation: USA. Program: Apollo. Spacecraft: A7L, Apollo CSM, CSM Communications. North American, Hamilton Standard, Grumman, David Clark, and MSC representatives, meeting in Downey, California, resolved all interfaces between the space suit and the two blocks of spacecraft. As a result of these agreements, MSC directed North American and Grumman to make some minor changes (suggested by the Crew Systems Division) in the communications cables; to remove the portable life support systems from the CM; and to add a thermal-meteoroid garment - rather than one providing merely thermal protection - to the CM. Two additional Apollo portable life support system (PLSS) batteries in LM - . Nation: USA. Program: Apollo. Spacecraft: A7L. MSC requested Grumman to make provisions for storage of two additional portable life support system (PLSS) batteries. This was an increase of two batteries over the previous requirement; requirement now was for two batteries in the PLSS and additional storage for six. Work on the A7L Space Suit visors - . Nation: USA. Program: Apollo. Spacecraft: A7L. Crews Systems Division reported that work on the suit visors was progressing well, and that operational mockups had been sent to North American for the upcoming critical design review. 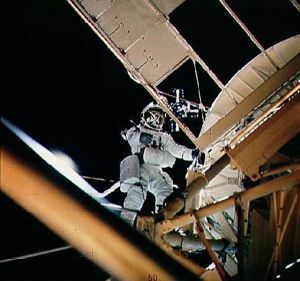 The visor could be attached and detached by a pressurized crewman; also, it afforded thermal protection and allowed a complete range of light attenuation. 1965 April 29-May 6 - . Problem of stowing portable life support systems in the Apollo CM - . Nation: USA. Program: Apollo. Spacecraft: A7L, Apollo LM, CSM Recovery. Portable life support systems (PLSS) stowed against the aft bulkhead in the CM would prevent the crew couch from stroking fully. This condition would be aggravated if, at impact, the bulkhead was forced inward. North American spokesmen maintained that, in a water landing, the bulkhead would give only slightly and that the couch struts would not compress to their limits. They argued, therefore, that this condition would be of concern only in a land landing. On the contrary, said MSC. Center officials were adamant that any interference was absolutely unacceptable: it would lessen the attenuation capability of the couch (thereby jeopardizing crew safety); possibly, the bulkhead might even be ruptured (with obviously disastrous results). Because of this problem - and because the capability for extravehicular transfer from the CM to the LEM was required - MSC invited representatives from the three contractors involved to meet in Houston to deal with the question of PLSS stowage. 1965 May 6 - . Apollo space suit with a pressure-sealing zipper - . Nation: USA. Program: Apollo. Spacecraft: A7L. As a result of the Critical Design Review at North American during the previous month, Crew Systems Division (CSD) directed Hamilton Standard to fabricate an Apollo space suit with a pressure-sealing zipper. CSD would compare this concept with the current gusset design, which leaked excessively and hindered donning the suit. 1965 May 12-June 24 - . Stowing Apollo portable life support systems (PLSS) discussed - . Nation: USA. Program: Apollo. Spacecraft: A7L, Apollo LM, LM Hatch. Representatives from North American, Grumman, Hamilton Standard, and MSC discussed the problem of stowing the portable life support systems (PLSS). Current specifications called for two PLSSs under the crew couch in the CM at launch, one of which would be brought back to earth. This location presented some serious problems, however. The capability for extravehicular transfer must be maintained. During translunar flight, the capability must exist for general extravehicular activity from the CM. And upon landing, the PLSS must not interfere with the sweep of the crew couch. The participants explored a number of stowage options (and the complications involved), even exploring the possibilities of staging and of using a Gemini Extravehicular Life Support System. As a result of these talks, Hamilton Standard began studying the feasibility of repackaging the PLSS to fit underneath the side hatch of the CM and to determine whether the reshaped system would be compatible with both spacecraft. Potential hazard in crew procedures inside the Apollo LEM - . Nation: USA. Related Persons: Slayton. Program: Apollo. Spacecraft: A7L, Apollo LM, LM ECS. PLSSs could not be recharged while the LEM was unpressurized. If the astronauts were planning to leave the spacecraft, they had to switch to the PLSSs and disconnect the ECS hoses before depressurizing their vehicle. Because the cooling circuit in the PLSS operated only in a vacuum, the crew must depressurize the LEM shortly after switching to their PLSSs. 1965 May 27-June 3 - . Apollo liquid cooling garment modified - . Nation: USA. Program: Apollo. Spacecraft: A7L, Apollo CSM. MSC's Crew Systems Division (CSD) received from Hamilton Standard Division a liquid cooling garment which had been modified to include a comfort liner. Preliminary tests by the contractor showed a substantial increase in comfort with only a small decrement to cooling capacity. CSD scheduled tests to validate the performance. 1965 May 28 - . Common communications equipment in Block I and II space suits - . Nation: USA. Program: Apollo. Spacecraft: A7L. ASPO approved the use of common communications equipment in Block I and II space suits. The hardware would be procured from North American (under their contract with Pacific Plantronics), then furnished to the suit contractors (David Clark and Hamilton Standard). 1965 June 9 - . Hamilton Standard to integrate seven layers of thermal protection into the Apollo A5H pressure suit - . Nation: USA. Program: Apollo. Spacecraft: A7L. Crew Systems Division reported that MSC had ordered Hamilton Standard to integrate seven layers of thermal protection into the A5H pressure suit..
1965 June 11 - . Gaseous oxygen storage for the Apollo LEM's environmental control system (ECS) - . Nation: USA. Program: Apollo. Spacecraft: A7L, Apollo LM, LM ECS, LM Weight. MSC ordered Grumman to propose a gaseous oxygen storage configuration for the LEM's environmental control system (ECS), including all oxygen requirements and system weights. Because no decision was yet made on simultaneous surface excursions by the crew, Grumman should design the LEM's ECS for either one-or two-man operations. And the Center further defined requirements for cabin repressurizations and replenishment of the portable life support systems. Oxygen quantities and pressures would be worked out on the basis of these ground rules. 1965 June 17-24 - . 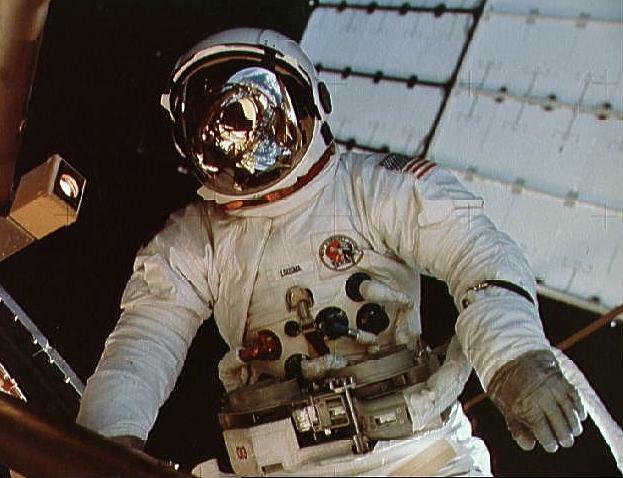 Space suits for the Apollo program evaluated - . Nation: USA. Program: Apollo. Spacecraft: A7L. Crew Systems Division began evaluating space suits for the Apollo program (submitted by Hamilton Standard, David Clark, and International Latex)..
1965 June 17 - . Battery recommendations for the Apollo portable life support system - . Nation: USA. Program: Apollo. Spacecraft: A7L. Crew Systems Division engineers evaluated various battery combinations for the portable life support system. The division recommended a three-hr main and a one-hr backup arrangement, which would save about 9 kg (20 lbs) in the total weight of the vehicle..
Hamilton Standard to study manual override to Apollo space suit pressure relief valve - . Nation: USA. Program: Apollo. Spacecraft: A7L. MSC directed Hamilton Standard Division to study the feasibility of incorporating a manual override in the current pressure relief valve. During lunar surface activity, a failed relief valve would prevent further operation of the suit..
1965 June 21 - . Requirement to connect the space suit to the Apollo LEM's environmental system - . Nation: USA. Related Persons: Shea. Program: Apollo. Spacecraft: A7L, Apollo LM, LM ECS. Joseph F. Shea, ASPO Manager, established as a firm mission requirement the capability to connect the space suit to the LEM's environmental system and to the portable life support system while in a vacuum. This capability was essential for operational flexibility on the moon's surface. 1965 July 11-17 - . Apollo Block II space suit preliminary design review - . Nation: USA. Program: Apollo. Spacecraft: A7L. During the period the NASA/Department of the Army agreement for use of Army helicopters to airlift LEM adapters was signed by both parties; the Apollo Block II space suit preliminary design review was successfully held by David Clark Company; and evaluation testing of the Apollo Block II space suits submitted by David Clark Company, Hamilton Standard Division and International Latex was completed, with data being reduced. Apollo spacesuit umbilical disonnects in a vacuum discussed - . Nation: USA. Program: Apollo. Spacecraft: A7L. 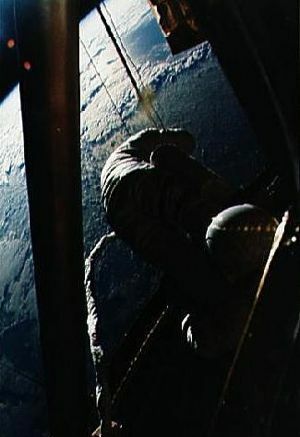 Joseph F. Shea, ASPO Manager, informed Flight Crew Operations that the capability had been firmly established for connecting and disconnecting the suit oxygen umbilicals in a vacuum. Crew Systems Division was modifying the connector (using a two-position release) to satisfy this requirement. This change would ensure safe umbilical operation while in an unpressurized spacecraft. 1965 August 2 - . First prototype Apollo portable life support system - . Nation: USA. Program: Apollo. Spacecraft: A7L. Hamilton Standard shipped the first prototype portable life support system to Houston, where it would undergo testing by the Crew Systems Division..
1965 August 6 - . Interface problems between Apollo LEM and portable life support system - . Nation: USA. Program: Apollo. Spacecraft: A7L, Apollo LM, LM ECS. Crew Systems Division (CSD) reported that changing the method for storing oxygen in the LEM (from cryogenic to gaseous) had complicated the interface between the spacecraft's environmental control system (ECS) and the portable life support system (PLSS). Very early, the maximum temperature for oxygen at the PLSS recharge station had been placed at 80 degrees. Recent analyses by Grumman disclosed that, in fact, the gas temperature might be double that figure. Oxygen supplied at 160 degrees, CSD said, would limit to 2½ hours the PLSS operating period. Modifying the PLSS, however, would revive the issue of its storage aboard both spacecraft. Seeking some answer to this problem, CSD engineers began in-house studies of temperature changes in the spacecraft's oxygen. There was some optimism that Grumman's estimates would be proved much too high, and MSC thus far had made no changes either to the ECS or to the PLSS. 1965 August 12 - . All-gaseous oxygen supply system in the Apollo LEM - . Nation: USA. Program: Apollo. Spacecraft: A7L, Apollo LM, LM ECS. Grumman received approval from Houston for an all-gaseous oxygen supply system in the LEM. While not suggesting any design changes, MSC desired that portable life support systems (PLSS) be recharged with the cabin pressurized. And because the oxygen pressure in the descent stage tanks might be insufficient for the final recharge, the PLSSs could be "topped off" with oxygen from one of the tanks in the vehicle's ascent stage if necessary. 1965 September 10 - . Development of antennas for the Apollo back pack - . Nation: USA. Program: Apollo. Spacecraft: A7L. Because of recent changes in the design of the space suit, Motorola, under its contract for suit communications antennas, began concentrating on the development of antennas for the back pack rather than on the helmet..
1965 September 20 - . Apollo Extravehicular Mobility Unit changes - . Nation: USA. Program: Apollo. Spacecraft: A7L. Amend the existing Hamilton Standard contract to provide for the development, qualification, and fabrication of the portable life support system and associated equipment only. This contract would cover delivery of all flight equipment for the Apollo flight program. Award a separate contract to International Latex Corporation for the development and fabrication of test and flight space suits and associated equipment. MSC would assume responsibility for total program management, systems integration, and space suit qualification. previous difficulties of Hamilton Standard in adequate total system development but recognizing their competence in the portable life support systems work. MSC planned to establish a resident engineer at International Latex to provide on-contractor-site management of the contractor. 1965 September 28-30 - . Interface control documents (ICD) for the Apollo space suit and associated equipment signed - . Nation: USA. Program: Apollo. Spacecraft: A7L. The current design of the CM environmental control system, because it could not accept waste water from the portable life support system (PLSS), was therefore incapable of recharging the PLSS. ASPO must decide if the recharge requirement was to be kept or eliminated. The CM's waste management system was not compatible with the capacity of the urine bag in the space suit. This problem was assigned to Crew Systems Division. 1965 October 3-9 - . Testing of Apollo extravehicular mobility unit at Flagstaff - . Nation: USA. Program: Apollo. Spacecraft: A7L. The U.S. Geological Survey cooperated with Crew Systems Division (CSD) in testing the extravehicular mobility unit under simulated lunar conditions at Flagstaff, Arizona. As a result, CSD technicians determined a number of deficiencies in the thermal meteoroid garment, and recommended a number of changes to make the garment more functional and more durable, as well as better fitting and more comfortable. Bubble-type helmet for the Apollo extravehicular mobility unit - . Nation: USA. Program: Apollo. Spacecraft: A7L. MSC announced that the bubble-type helmet, designed by Crew Systems Division (CSD) engineers Robert L. Jones and James O'Kane, had been adopted for use in the Apollo extravehicular mobility unit. The new helmet was smaller and lighter than earlier types; extensive studies by CSD had demonstrated its superior comfort, visibility, and don/doff characteristics. 1965 November 4-12 - . Design of the Apollo Block I space suit helmet ear cup and attachment was finalized - . Nation: USA. Program: Apollo. Spacecraft: A1C, A7L. The design of the Block I space suit helmet ear cup and attachment was finalized. Based on evaluation of AFRM 007 acoustic test data, it was determined that existing Gemini-type "soft" ear cups were adequate for Block I flights. North American and David Clark Company specifications would be changed to reflect revised requirements. The majority of drawings for the suit had been reviewed and approved by MSC's Crew Systems Division. Remaining to be resolved and approved were selection of helmet visor material, installation of helmet microphones and earphones, communications harness, and fingertip glove lighting systems. 1965 November 5 - . International Latex to build Apollo space suit, and Hamilton Standard portable life support system - . Nation: USA. Program: Apollo. Spacecraft: A7L. NASA announced that it would negotiate with International Latex Corporation for an estimated $10 million contract to fabricate the Apollo space suit consisting of the liquid-cooled undergarment, constant wear garment, pressure garment assembly, and thermo-micrometeoroid protective overgarment. At the same time an estimated $20 million contract was negotiated with Hamilton Standard Division of United Aircraft Corporation for continued development and manufacture of the portable life support system with a four-hour main power supply subjected to a maximum stowage soak temperature of 328K (130 degrees F). 1965 November 9-12 - . Apollo airlock gas connectors allowed a possible catastrophic failure - . Nation: USA. Program: Apollo. Spacecraft: A7L. Upon examination of the airlock gas connectors at the Portable Life Support System Emergency Oxygen System Preliminary Design Review, ASPO representatives discovered a possible catastrophic failure. If an astronaut unhooked the PLSS supply umbilical before the exhaust line was disconnected the suit would vent through the PLSS. A request for change was rejected by the preliminary design review board in spite of this situation. ASPO recommended to the Crew Systems Division that the connectors be modified or that the problem be solved another way to preserve crew safety. 1965 November 10 - . Apollo CM couch might strike the Apollo CM structure or stowed equipment on landing - . Nation: USA. Program: Apollo. Spacecraft: A7L, Apollo CSM, CSM Hatch, CSM Recovery. A North American layout of the volume swept by the CM couch and crewmen during landing impact attenuation showed several areas where the couch and or crewmen struck the CM structure or stowed equipment. One area of such interference was that the center crewman's helmet could overlap about four inches into the volume occupied by the portable life support system (PLSS) stowed beneath the side access hatch. The PLSS stowage was recently changed to this position at North American's recommendation because the original stowage position on the aft bulkhead interfered with the couch attenuation envelope. The contractor was directed by MSC to explain this situation. 1965 November 11 - . Apollo manned lunar mission metabolic profile test run - . Nation: USA. Program: Apollo. Spacecraft: A7L, Apollo LM, LM Electrical. A manned lunar mission metabolic profile test was run in the Hamilton Standard Division altitude chamber using the development liquid-cooled portable life support system (PLSS). The system was started at a chamber altitude of over 60,906 m (200,000 ft), and the subject adjusted the liquid bypass valve to accommodate the programmed metabolic rates which were achieved by use of a treadmill. Oxygen was supplied from an external source through the PLSS bottle and oxygen regulation system. This procedure was used because bottle qualification was not complete, so pressure was limited to 2,068 kilonewtons per sq m (300 psig). An external battery was used for power because the new batteries that were required by the change to the all-battery LEM were not yet available. The thermal transport system including the porous plate sublimator was completely self-contained in the PLSS. All systems operated within specification requirements and the test was considered an unqualified success. 1965 November 12 - . Apollo portable life support system Preliminary Design Review - . Nation: USA. Program: Apollo. Spacecraft: A7L. The portable life support system Preliminary Design Review was completed. The design was essentially complete and no major discrepancies were noted during the review..
1965 November 30 - . Multiple gas connector (MGC) for the Apollo extravehicular mobility unit deleted - . Nation: USA. Program: Apollo. Spacecraft: A7L. Usage of a multiple gas connector (MGC) with the extravehicular mobility unit (two per suit) was deleted. Instead of the MGC, a separate inlet and outlet suit umbilical gas connector manufactured by Airlock, Inc., would be used (two inlets and two outlets per suit). This design change applied to all Block II space suits, environmental control systems, and portable life support systems. Hamilton Standard was directed to implement the change by means of a negotiated revision of a supplemental agreement to its contract. 1965 December 5 - . Hamilton Standard tested Apollo life support back pack - . Nation: USA. Program: Apollo. Spacecraft: A7L. Hamilton Standard successfully tested a life-support back pack designed to meet requirements of the lunar surface suit. The system functioned as planned for more than three hours inside a vacuum chamber, while the test subject walked on a treadmill to simulate the metabolic load of an astronaut on the lunar terrain. The 29.48-kg (65-lb) portable life support system supplied oxygen, pressurized to a minimum 25,510 newtons per sq m (3.7 lbs psi), controlled its temperature and relative humidity, and circulated it through the suit and helmet. The pack pumped cooled water through the tubing of the undergarment for cooling inside the pressure suit. A canister of lithium hydroxide trapped carbon dioxide and other air contaminants to purify the oxygen for reuse. 1966 January 3 - . Cross section of materials for the Apollo A6L thermal meteoroid garment - . Nation: USA. Program: Apollo. Spacecraft: A7L. MSC directed International Latex Corporation to use the following cross section of materials in fabricating the A6L thermal meteoroid garment, outside to inside: One layer of six-ounce Nomex cloth; seven layers of H.R.C. super-insulation, starting with one-fourth mil aluminized mylar and alternating with 1.5-mil unwoven dacron spacers; two layers of seven-ounce neoprene rip stop nylon (one side coated with neoprene). 1966 January 3-7 - . Preliminary Design Review for the Apollo Block II pressure garment - . Nation: USA. Program: Apollo. Spacecraft: A7L, Apollo CSM. The Preliminary Design Review for the Block II pressure garment assembly was held at International Latex Corporation..
1967 July 3 - . Small air bottle proposed to prevent CO2 buildup in the Apollo Block II spacesuits in emergencies - . Nation: USA. Program: Apollo. Spacecraft: A7L. To prevent flight crew incapacitation from possible carbon dioxide buildup in their Block II spacesuits after emergency exit from a spacecraft, development of a small air bottle was proposed. Bottles, to be attached to the suit to provide proper atmosphere in an emergency, would be stowed on the spacecraft access arm until needed. 1967 July 24 - . Decision to leave both Apollo PLSS on the lunar surface - . Nation: USA. Program: Apollo. Spacecraft: A7L, Apollo LM. The ASPO Manager summarized the lunar module oxygen capacity and design requirements for the lunar mission and made an analysis of his decision to leave both portable life support systems (PLSS) on the lunar surface. He recommended that NASA OMSF accept the PLSS discard philosophy as well as the design capacity for lunar module oxygen. Studies of ignition sources inside the Apollo pressure suits worn by the astronauts - . Nation: USA. Program: Apollo. Spacecraft: A7L. ASPO wrote Lewis Research Center about studies of ignition sources inside the pressure suits worn by the astronauts. In recent tests, the communications and biomedical circuits inside the suit and connected to the spacecraft panel through the crewman electrical umbilical were evaluated to determine the ignition characteristics. Studies on the flammability of various materials used jn the suit loop had been completed and the data compiled. 1967 November 11 - . Apollo Beta fabric underwear reported source of excessive lint and irritated the skin - . Nation: USA. Program: Apollo. Spacecraft: A7L. Tests of sample constant-wear garments (underwear) fabricated from Beta fabric were reported as showing the garments were a source of excessive lint and irritated the skin. Efforts were being made to fabricate a knitted garment that would overcome these problems. Other flame resistant materials and flame retardant treatments were also being investigated. However, since delivery schedules of training and initial flight items required an immediate decision concerning material selection, it was decided to use the original cotton undergarment configuration. 1968 May 24 - . Recommended program for Apollo spacesuit modifications to achieve greater astronaut maneuverability - . Nation: USA. Program: Apollo. Spacecraft: A7L. Apollo Program Director Samuel C. Phillips requested from MSC Director Robert R. Gilruth a recommended program for spacesuit modifications to achieve greater astronaut maneuverability. The modifications were required for lunar landing missions, because extravehicular activities such as sampling and instrument deployment were difficult and time consuming with the present suit configuration. Phillips asked for trade-off studies to achieve optimized life support systems, an analysis of mobility requirements and techniques to enhance mobility, and studies of crew station requirements and problem areas such as suit repair, storage, and checkout. 1968 July 10-11 - . 1968 September 30 - . Apollo D and G missions to test Apollo EMU - . Nation: USA. Program: Apollo. Spacecraft: A7L, Apollo CSM. Apollo Program Director Samuel C. Phillips asked ASPO Manager George M. Low to investigate the feasibility of using data from the D and G missions to increase NASA's knowledge of and confidence in the operational capabilities of the extravehicular mobility unit (EMU). Phillips included in his request specific recommendations for additional instrumentation to obtain the necessary data. His action stemmed from a general concern about the extent and complexity of surface operations on the first lunar landing flight (which might substantially reduce chances for successful completion). For this reason, he and other program officials had stringently limited the number of objectives and the extent of those surface activities. But to plan confidently for surface EVA during follow-on Apollo landing missions, Phillips said, as much information as possible had to be gathered about the operational capability of the crew and the EMU. 1968 November 22 - . Astronaut training runs with the Apollo extravehicular mobility unit - . Nation: USA. Program: Apollo. Spacecraft: A7L. In a memorandum for the record, ASPO Manager George M. Low summarized results of November 19 and 22 meetings on procedures for astronaut training runs with the Apollo extravehicular mobility unit (EMU) under simulated space conditions. The runs would be in the two vacuum test chambers of the Center's Space Environment Simulation Laboratory. MSC Director Robert R. Gilruth had attended the meetings. Training runs were always to be preceded by a run also under altitude conditions and using a gas umbilical from the life support system of the facility itself. Although connected to the crewman, the facility umbilical would not be used as a gas supply under normal test conditions. For the final training run, the astronaut would wear a complete flight-configured EMU without any other link with the facility. Although several participants objected that training runs using the EMU alone ran greater risk than normal in chamber tests, the decision to conduct the exercises using the all-up flight configuration was reaffirmed. Reviews of Apollo testing procedures - . Nation: USA. Program: Apollo. Spacecraft: A7L. Improved management control of suit processing and checkout to afford higher confidence in configuration, inspection, and performance integrity. Stricter enforcement of the acceptance data package on each delivered suit. Compulsory contractor updating and enforcement of specifications to meet MSC spacesuit requirements. Improved and rigidly enforced discipline and cleanliness. These problems, Phillips noted, had not impaired flight readiness of the spacesuit, "but it does explain the delivery problems we have been experiencing." 1969 March 1 - . No data on energy expenditure by Apollo astronauts - . Nation: USA. Program: Apollo. Spacecraft: A7L. The Apollo Program Director expressed concern about the inability to obtain adequate data on the expenditure of energy by astronauts during lunar exploration. The problem was discussed with the medical and crew systems personnel. The consensus was that the only meaningful indicator of human energy expenditure which could be developed into an operational procedure in time for lunar landings would be measurement of carbon dioxide production. From a technical standpoint the most feasible means of doing this would be incorporating a carbon dioxide measurement system in the portable life support system. A study was initiated to determine how quickly a measurement system could be developed and to estimate the cost. 1969 March 6 - . 16:45 GMT - . EVA Apollo 9-1 - . Crew: Schweickart, Scott. EVA Duration: 0.0319 days. Nation: USA. Related Persons: Schweickart, Scott. Program: Apollo. Class: Moon. Type: Manned lunar lander. Flight: Apollo 9. Spacecraft: A7L, Apollo LM. Stand-Up External Vehicular Activity. Tested Apollo spacesuit..
1969 May 5 - . Apollo manned-test abort of the portable life support system - . Nation: USA. Program: Apollo. Spacecraft: A7L. ASPO reported a recent manned-test abort of the portable life support system had been caused by a nonfunctional lithium hydroxide canister. Quality control procedures were in existence and if properly implemented would have precluded the abort incident. To prevent similar incidents from occurring, all manned-test and flight equipment would be accompanied by complete documentation, would be visually inspected, and would be certified by quality assurance personnel before use. Vision distortion found looking through the Apollo helmet during Water Immersion Facility training - . Nation: USA. Program: Apollo. Spacecraft: A7L. Vision distortion was found when looking through the pressure garment assembly helmet during Water Immersion Facility training activities at MSC. Curvature of the helmet caused objects to appear distorted, hampering crew training. Studies were being made in an effort to correct the problem. Negotiations were also under way with the Department of the Navy to provide a modified indoctrination course in open-circuit SCUBA for a number of astronauts, to ensure their safety while training in the Water Immersion Facility. 1969 July 11 - . MSC terminated the development of the A9L space suit, - . Nation: USA. Program: Skylab. Spacecraft: A7L, A9L. MSC terminated the development of the A9L space suit. The AL7 space suit, used in the Apollo program, would continue in use until replaced by a flight-qualified, constant-volume suit. During the Mercury program a modified version of the Goodrich Navy Mark IV suit was used. In the Gemini program a modified version of a suit developed by David Clark Company for the USAF was used. Hamilton Standard had overall development responsibility for the Apollo suit and associated portable life support system. A subcontract was awarded to International Latex Corporation for development of this suit. After suit development was completed, the production contract was awarded to International Latex, and the initial suit was designated A5L. The A6L design incorporated a thermal/ meteoroid garment. Following the Apollo fire, the suit was redesigned to eliminate flammable materials and was designated A7L (designation A8L was never used). Two hard-shell, constant-volume suits were under development, an extravehicular suit was being developed by Litton Industries, and an intravehicular suit was being developed by AiResearch Corporation. Both of the latter would be used in the Apollo Applications Program. Major milestones for the Apollo 16-20 missions - . Nation: USA. Program: Apollo. Flight: Apollo 16. Spacecraft: A7L. Major milestones were reached for extending astronauts' staytime on the moon and increasing their mobility for the Apollo 16-20 missions. Modifications in the A7L spacesuit incorporating improved waist mobility were authorized, and letter contract authority for the portable life support system secondary life support system was approved. 1971 February 22 - . MSC requested removal of sharp corners from the Apollo lunar roving vehicle (LRV) seat - . Nation: USA. Program: Apollo. Spacecraft: A7L, Apollo LRV. MSC requested removal of sharp corners from the lunar roving vehicle (LRV) seat. During a recent series of LRV/EMU (extravehicular mobility unit) tests, a nicking or tearing of the portable life support system thermal cover had been discovered. Observation revealed that the thermal cover was contacting sharp corners on the LRV seats, when the test subject entered and left the vehicle. 1972 August 25 - . Twenty-four Skylab suits were delivered. - . Nation: USA. Program: Skylab. Spacecraft: A7L. Twenty-four Skylab suits were delivered by the space suit manufacturer, International Latex Corporation; five were ready for delivery, nine were in the manufacturing process, and material for the remaining three had been procured. .